Ancho-V Games is a multiplayer stage in Splatoon and Splatoon 2. It is a large office complex housing a game design studio, hence its name. The defining feature of the stage are propeller lifts that are central to the navigation of the stage. Ancho-V Games has raised floors and interactive platforms, it is unique in its incorporation of propellers from Octo Valley in the form of fans. When these fans are hit by Ink, the platform underneath moves. If the fans are subsequently left uninked, the platform will slowly fall back to its original position. There are three different platforms with fans that can be found on both sides of the stage, making a total of six fans. One can be found to the right of the Spawn Point that moves horizontally, another in the central part of the stage that moves vertically, and one to the left of the Spawn Point that moves both horizontally and vertically. Side lanes are areas, off to the sides, can occasionally be missed later in the game, unless a team is pushing into their enemy's base. Each lane contains a single fan; following one of the lanes eventually brings the player to the center of the map. These areas open opportunities for flanks if a team gains control of the opposing team's main lift. Center lifts are the main lifts used in all game modes. When lowered, the center looks flat, with the exception of a couple of boxes placed for cover. When the platforms are raised, the center becomes a place for close quarters combat, since there is no longer lots of space to move around in. A propeller lift image displayed when getting splatted by enemy ink from it. When ink is fired on a propeller lift, it is activated and the whole platform moves, some of the Ink that is used to spin it comes out of the top similar to a Sprinkler. Also like a Sprinkler, this Ink does a small amount of damage if it hits a player of the opposing team. If they are splatted by this, the splat is attributed to the last player to spin the fan, but will say, "Splatted by ink from a propeller lift!" In Splatoon 2, the left side of spawn where the small, square propeller lift would be located has been gotten rid of and has been replaced with a new section featuring a long, rectangular propeller lift, which has walls on the sides for cover that allows players to drop into the middle area with no means of return. The middle section has also been updated. The two propeller lifts have been cut in half and are now a lot smaller with small raised platforms added at the removed portions, however there is now a lot more space to ink in the middle. Two pillars have been added at each team's right, which can be used as another method of getting to higher elevation aside form the propeller lift. The area immediately in font of base has always been modified, with much more area accessibly by the opposing team. Sponges have been added to the stage. The Splat Zone is located in the very center of the stage, included with the boxes in the middle. Some boxes have been added to the Side Lanes to give both teams some attacking space and to keep the other team from entering the center a certain way. The tower is located at the center, replacing the boxes normally there. The goals are located near the front of each spawn, which has also been moved to the left, replacing the floating platforms once there. The fan in front or both team's regular spawn has been taken out and the platform has been extended permanently. Several boxes and platforms have been added to help with defense and offense for both teams. The rainmaker is located at the center, above the boxes in the middle. Boxes have been added to the middle area, giving players an extra route into enemy territory. A ramp has been added to reach the spawn area of each team and a pile of boxes near it. The goal is located near the spawn next to an ink-propelled moving platform. If the fan on the platform is not inked, it can be difficult for a Rainmaker carrier to make the jump to the platform. In Splatoon 2, the goal has been moved to the new area that immediately drops off from spawn. A new inkable wall has been added in the central area to make accessible the opposing team's side easier. There are three primary routes that can be taken. The new inkable wall and propeller lift allow access to the left path. Using the Rainmaker shot itself, players are able to call in the propeller lift located on the right side of the map, which will allow access to the right path. The baskets are located deep into each team's side of the map, located just in front of the drop of plaza. In order to reach the basket, players must either ride up the propeller lift into the enemy area or swim up a small inkable block added to access the right path into the enemy base. The inkable pillar seen in other modes used as an alternative to the propeller lift has been removed. Ancho-V Games was announced on 16 December 2015 along with Piranha Pit and released on 22 January 2016 at 02:00 UTC. It is the final stage released for Splatoon. Fixed an issue in Rainmaker mode, in which certain terrain wasn’t appearing correctly on the turf map when inked. An Inkling flicks an Inkbrush at a fan. A Killer Wail set off amidst a chaotic battle. A desk covered in Splatoon concept art. A wide view of Ancho-V Games. Advertisements and other graphics plastered around the stage. A team of Inklings leaves its Spawn Point. An Inkling shooting ink at a fan. A jellyfish working at a computer. A .52 Gal against a Splat Charger doing Bomb Rush. Using a horizontal propeller at Ancho-V Games. A jellyfish with Studio Headphones in a small room in the central area. The room mirrored on the other side, with a jellyfish typing at a computer. A jellyfish wearing a Krak-On shirt, likely the Sunny-Day Tee. 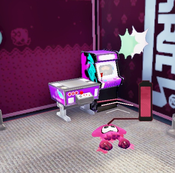 Two jellyfish in another small room next to an Arcade Machine. The servers and a jellyfish below one of the central fan-powered platforms. A cafeteria full of jellyfish. A meeting room full of jellyfish. Ancho-V Games' doors are much larger than their jellyfish employees. The first set of magazines near one of Ancho-V Games' workspaces. Propeller lift icon in the splat-cam when splatted. Ancho-V Games was announced on 12 July 2018 at 05:13 UTC, along with the Nautilus 47 and the Bloblobber. It was added to the game on 1 August 2018 at 00:00 UTC. An Inkling looks at an Arcade Machine. This stage's name is likely a reference to the real-life anchovy. Splatoon concept art can be seen throughout this stage. The Arcade Machine is featured in Ancho-V Games, with four individual machines throughout the stage. Unlike the one in Inkopolis Plaza, they cannot be interacted with. 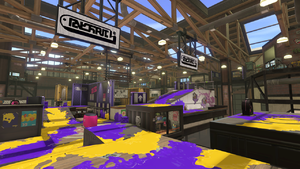 Ancho-V Games, Walleye Warehouse, and Kelp Dome are the only stages in Splatoon not located outdoors. In Splatoon 2, many of the new stages are indoors: Musselforge Fitness, Humpback Pump Track, MakoMart, Shellendorf Institute and Goby Arena. According to the Squid Sisters, Ancho-V Games is the studio that created Squid Jump. In the announcement tweet for this Stage in Splatoon 2, it is revealed that in-universe, that Ancho-V Games are also the company that also created Squid Beatz 2. It's highly likely that they also created the other Arcade Machine games, such as Squid Racer, Squidball and the first Squid Beatz. This stage has a very high concentration of jellyfish, with some at work on computers in small rooms with glass doors, some above the stage on catwalks, and large groups below the stage at a cafeteria. The internal codename for this stage in the game files is "Office". The stage's location in Splatoon and Splatoon 2 is actually not the same, but a different building across the street. 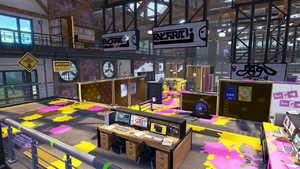 One of the stage quotes in Splatoon 2 even has Pearl wonder why the made the new office layout exactly the same as the old one. Ancho-V Games was the only stage introduced in 2016. ↑ A video game company-esque name, adding "t" to its end sounds like the word "bit". In addition, the name sounds like "Namcot", a shortened word for "Namco Home Entertainment". Namco (BANDAI NAMCO Entertainment Inc) is a video game company that has made collaborations with Nintendo in "Mario Kart Arcade GP", "Super Smash Bros. series", and so on. The PC monitor in this stage shows a 8-bit style character like "Pooka" in "Dig Dug" from Namcot. It is one of relatable video game companies to Nintendo. This page was last edited on 11 April 2019, at 12:34. This page has been accessed 46,661 times.